Sneaky, sneaky these two are, I tell ya. For weeks there have been hints, sneak peeks and mentions of a collaborative effort on each of their blogs, and yet it was a complete surprise to me when the results of those efforts arrived in a package on my porch this afternoon. Once these were both unwrapped, I was crying. I'll spare you all the long, rambling "amazement" at the blogging crafting community rant I'm known to go on, and just say that these sweet handmade gifts from Lisa and Stephanie meant a lot to me. 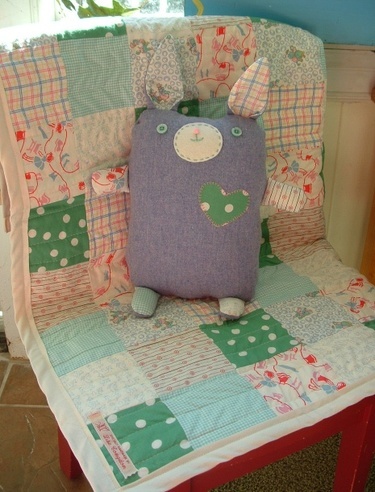 This quilt (by Lisa) is so lovingly and beautifully made with the perfect fabrics (oh, I love, love, love them! 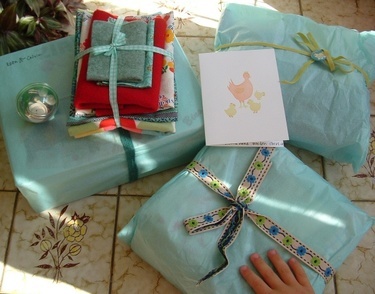 ), and the softie (by Stephanie) that matches (matches!) is so snuggly and sweet that I might have to sleep with it until the baby arrives. And they were so thoughtful to include a little giftie for Calvin and Ezra. So perfectly chosen it was, too, this play circus, as you can see from their intent play with it, ignoring all requests for a "camera smile". Thank you, thank you my friends. Really and truly.